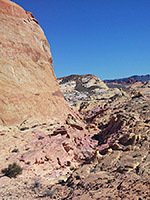 The best scenery in Valley of Fire State Park is along the 5.7 mile Mouse's Tank Road, a spur off the main highway, as here the otherwise pure red rocks are mixed with strata of different, lighter colors - pink, orange, yellow and white, the contrasting layers often in close proximity. 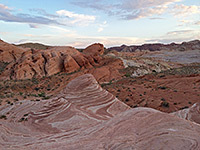 While cross-country hiking is quite possible, although restricted by cliffs and ravines, there are three recognized hiking routes starting along the road, to Mouse's Tank and Fire Canyon Wash, the White Dome Trail at road's end, and the short path to Fire Wave, this the unofficial name of a swirling formation of red and white, reminiscent of the larger and more complex Wave in the Coyote Buttes region of north Arizona. 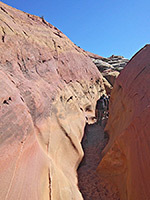 An off-trail extension, recently promoted by the state park service who offer a ranger-guided tour along the route, proceeds from the wave along Kaolin Wash, through two short slot sections of which the longer and most colorful is known as Pastel Canyon or Pink Canyon, then returns to the trailhead along a lesser gully, past another stripy formation, Crazy Hill. 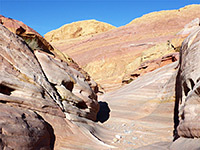 The loop is 2 miles in length, over fairly level terrain with just a few brief climbs and descents; sometimes along soft sand but mostly hard rock. 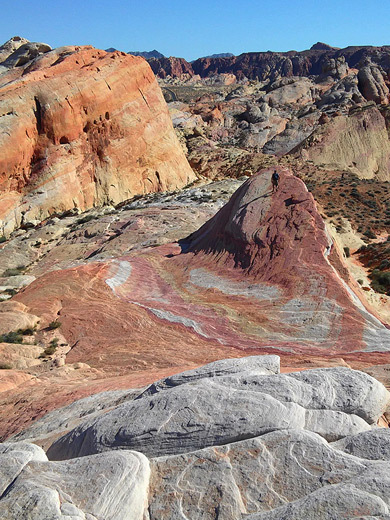 The bright, banded colors of the sandstone are similar to various other places in this part of the Southwest such as Buckskin Hollow and Little Finland. 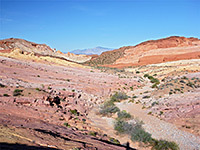 Kaolin Wash crosses Mouse's Tank Road 4 miles north of the junction with Valley of Fire Highway, and the shallow slot of Pastel Canyon begins just 400 feet downstream (northeast), while a shorter narrows section is a third of a mile upstream, but the loop hike, and one-way trips to either Crazy Hill or Fire Wave begins 0.7 miles north, at a large parking area on the west side of the road - parking no. 3. The path to Fire Wave starts by following the road southwards for a few hundred feet, as far as a small sign marked 'Wave', pointing southeast, after which the path moves away from the road, crossing bushy, sandy land while heading towards the distant drainage of Kaolin Wash, soon coming close to the base of a low promontory of orange and white sandstone. 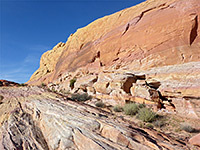 The Wave is found at the southwest edge of this promontory, between two little mounds, just 220 feet from the usually dry streambed of the wash, which is angled east-west, bordered by low slickrock slopes. 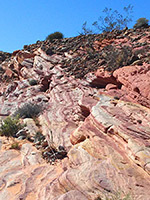 Downstream, the surrounding rocks are briefly black and then light grey; layers of conglomerate, but they are more colorful and vivid upstream, the most prominent shades being orange and pink. 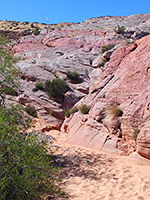 The drainage remains relatively wide, with bushes growing along the sandy creek bed, before the enclosed section of Pastel Canyon, which is only 300 feet long, and shallow, but pretty, bordered by smooth, light-colored walls. 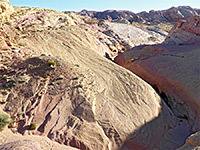 Kaolin Wash crosses the road just beyond the upper end of the Pastel Canyon slot, and continues past more rocky, photogenic, similarly-colored terrain, and through a shorter (130 foot) slot, soon after which it meets the White Dome Trail, part of which runs through a third section of narrows, rather deeper than the other two. The last part of the loop hike, to Crazy Hill, leaves the wash to the north, following the first tributary after the second slot, a minor drainage that continues perfectly straight all the way to the trailhead. 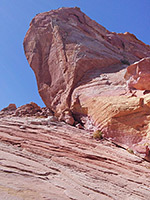 The hill is half way (a quarter of a mile) along, on the east side of the path, at the edge of a sandstone outcrop about 50 feet above the desert floor.